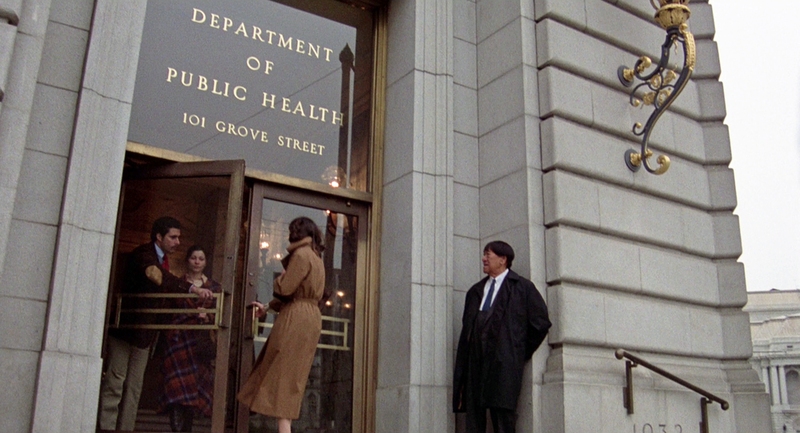 Then... Elizabeth and Matthew are both employed by the city's health department. On her way to work she passes a street busker (Joe Bellan, banjo recorded by Jerry Garcia of the Grateful Dead) and his faithful boxer companion. ... and Now, this is Polk Street near the Grove Street corner in the Civic Center (map). 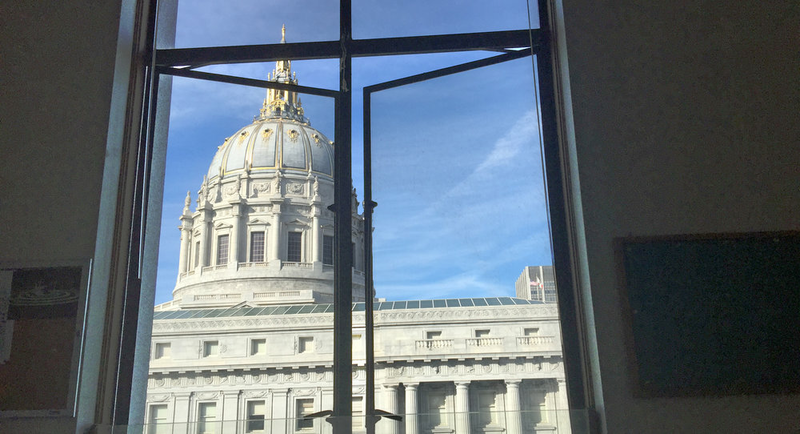 The view looks west past City Hall at far right and towards the War Memorial Opera House across Van Ness. Davies Symphony Hall, there since 1980, is across Grove opposite the Opera House. Then... She enters her workplace at 101 Grove Street (map). ... and Now, except for the ADA wheelchair sign and a handrail replacement the entrance looks exactly the same. Then ... She joins Matthew and a colleague in the lab; he is absorbed in scrutinizing a baked potato for contamination. ... and Now, the rooms that comprise the lab area, on the top (4th) floor, have been rearranged and refitted significantly since the moviemakers were here. This is the most likely one used for this scene. Then ... 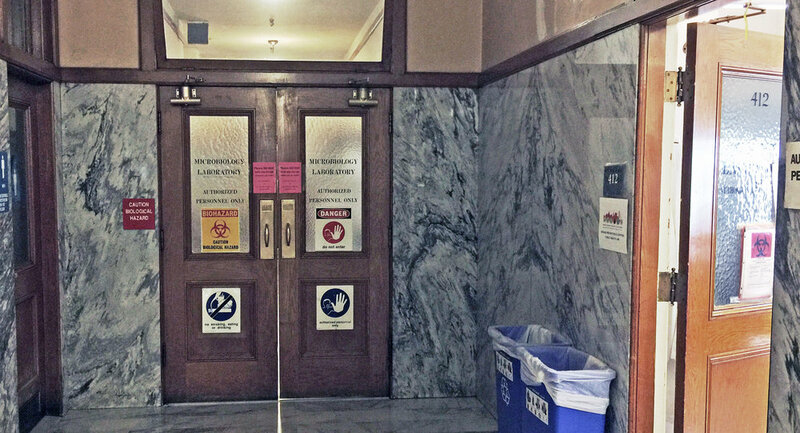 They leave the lab, then and now called the Microbiology Laboratory, and head past room 412 towards his office. ... and Now, today's safety-conscious era dictates an abundance of warning signs. Then ... Window views enabled CitySleuth to home in on Matthew's office. ... and Now, the same office today has been divided into cubicles. This is room 410 on the top floor of the building - the view looks across Grove Street to the south side of City hall. The office window is indicated here, overlooking Grove Street. ... and Now, from room 410 today note the position of the lamppost relative to a statue pedestal beyond it. Only this room's view has that matching alignment. ... and Now, just as it does today. This is strange ... from outside Matthew's office we see a man peering intently through the glass at them. Then ... And as Elizabeth walks back to the lab, two more people are staring at her. What is going on? ... and Now, in this view of the top floor corridor we expect the marbled walls to be unchanged but we also note from the patterns that the floor tiles are the same ones as 40 years ago, in excellent condition.